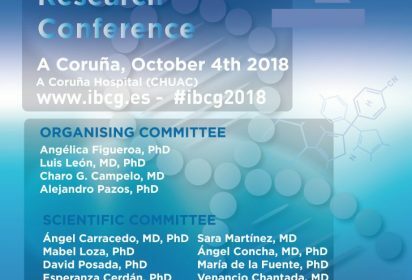 The Biomedical Research Institute A Coruña (INIBIC) organizes the V Edition of Biomedical Cancer Research Conference in Galicia (IBCG-2018). On October 4th, Ceres Fernández, will be sharig an oral communication on PanCanRisk’s results. This conference will bring together basic and clinical experts who are working on the most innovative current research topics in human malignancies and animal models, including inmunooncolgy, metastasis-associated microbiota, tumor heterogeneity, cancer and inflammation and novel therapies. The purpose of this conference is to provide a stimulating and interactive environment, including a session to promote the participation of researchers at early stages of their training. A joint investigation from 6 top research centers in Europe to improve the detection and prevention of cancer. The PanCanRisk Consortium, led by Prof. Ángel Carracedo at the Galician Public Foundation for Genomic Medicine presented this week in Santiago de Compostela the advances and conclusion of the three-year work. 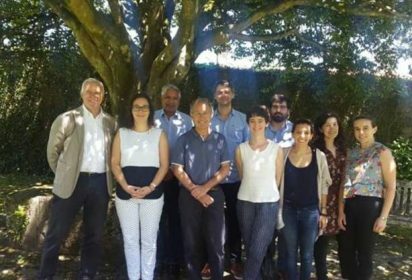 On 18-19 June 2018, Santiago de Compostela was the host of an international meeting on cancer genetics research: 13 scientists from top institutes in Spain, France and the UK participated on 18 and 19 June in the final meeting of the PanCanRisk project. Led from Spain by the team of Prof. ÁngelCarracedo at the Galician Public Foundation for Genomic Medicine (FPGMX), PanCanRisk – Personalised Bioinformatic For Global Cancer Susceptibility Identification & Clinical Management– was born to identify novel hereditary risk factors that predispose to cancer and to develop novel biomarkers of early diagnosis. With almost 3M€ of European funding and over 20 researchers from the FPGMX, the Dexeus clinic and the CRG (Barcelona), the Institute Curie (Paris), the EBI and Protein Logic (Cambridge), the project proposed back in 2015 to improve the bioinformatic tools available in order to detect novel and rare variants that confer risk to developing cancer amongst the heaps of currently available genomic data. The meeting highlighted the advances and results obtained during these three years. Over this time, the different teams have progressed in the development and optimization of novel discovery algorithms, the validation of results in clinical cohorts from screening programs and the functional verification of the data. The most relevant result to date is the identification of two novel genes that increase the likelihood of developing breast and bowel cancers. These results show great promise for the identification of perhaps novel mechanisms in cancer development that may lead the way to the generation of novel and earlier diagnostic and predictive biomarkers. Hence, the team will continue working on the functional implications and roles that these genes play in cancer. A better comprehension of these mechanisms could potentially aid in the development of novel and more targeted therapies that can help improve the life of cancer patients. In 2014, an ambitious European genetic research project started with the main objective of identifying new hereditary cancer risk factors. Led from Santiago de Compostela by the team of Dr. Ángel Carracedo at the Galician Public Foundation of Genomic Medicine, PanCanRisk –Personalised Bioinformatics For Global Cancer Susceptibility Identification & Clinical Management– involves over 20 researchers from six institutes and reference research centers across Europe, two of which are based here in Cambridge. The project is based on the fact that current technologies allow us to obtain and analyze large amounts of genetic data quickly and relatively easily. Noting the need for an adapted statistical analysis, they propose to improve the current algorithms by developing new methods. The goal: to find new genes related to the risk of developing cancer among the tide of currently available data. The solidity of the approach and the excellence of the research teams involved warranted funding for 2.9M € from the European Union H2020 program for a three-year project. In addition to the large-scale statistical analysis, the project also considers the validation of the results in real samples of patients obtained from usual clinical processes, such as colon and breast screening programs. Subsequently, functional models that can be applied to clinical practice will be designed, aimed to improve detection, prevention and diagnostic protocols. Today, the PanCanRisk team faces the final stretch of the project. On June 18th an 19th, an international meeting will be held in Santiago de Compostela to share the progress and results obtained. We will know then if PanCanRisk can deliver on their promise to deliver an earlier diagnosis and more tailored risk screening strategies. (La Voz de Galicia) La Fundación Pública Galega de Medicina Xenómica (FPGMX) diagnostica 20.000 pacientes al año. La mitad, de tumores, de los que 8.000 se tratan en servicios de Oncohematología y 2.000 son hereditarios, sobre todo de mama, ovario, colon y recto. Los otros 10.000 casos son enfermedades genéticas raras, de todos los servicios hospitalarios. «Somos el centro de Genómica de mayor volumen de España. Podemos diagnosticar cualquier enfermedad genética rara, aunque no siempre es posible encontrar la causa», afirma Ángel Carracedo, quien, con Fernando Domínguez, dirige este centro del Servizo Galego de Saúde (Sergas). The PanCanRisk project is a laboratory test designed to study genetic material. It consists of analyzing regions of the human genome (PanCanRisk test) to detect genetic alterations that may be related to a genetic predisposition to cancer. Its objective is to define the genes and genetic variants associated with the risk of breast cancer, and to compare the frequency and type of genomic variants between the populations of breast cancer cases and those that serve as control (with no known background). 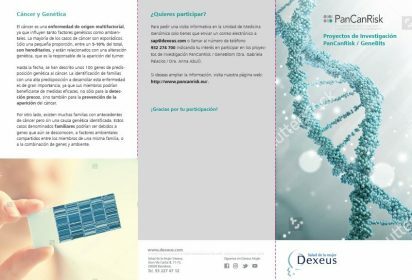 Clínica de la Mujer Dexeus (one of the partners of the PanCanRisk project in Spain) has launched a leaflet in order to inform women about the possibility of taking part in research studies in the framework of PanCanRisk. Collaboration in research studies is essential for the advancement of science and beneficial to society. Through voluntary participation we can help broaden the current knowledge about cancer and this information may be useful in the future for other people. • Women aged 40-65 years who have had one or more normal mammography results in Women’s Health Dexeus in the last 6 months (BI-RADS 1-2) and who have no personal or family history of cancer at an early age ( provide the latest mammography result). 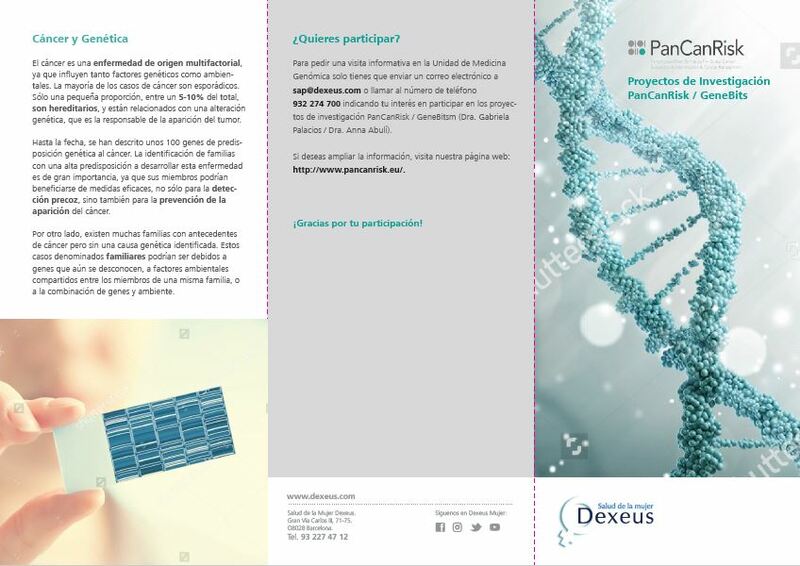 If your profile corresponds and you are interested in participate, please request an informative visit in the Genomic Medicine Unitby sending an email to sap@dexeus.com or calling +34 932 274 700 indicating your interest in participating in the PanCanRisk / GeneBitsm research projects (Dr. Gabriela Palacios / Dr. Anna Abulí). La Fundación Ramón Areces acaba de adjudicar 475.745 euros a cuatro nuevos proyectos de investigación gallegos sobre cáncer, enfermedades raras, seguridad alimentaria y energía renovable. Los cuatro proyectos fueron seleccionados de entre 631 investigaciones presentadas al concurso nacional de Ayudas a la Investigación en Ciencias de la Vida y de la Materia que la institución convoca bianualmente. Con este concurso, la Fundación Ramón Areces pretende contribuir a consolidar una sólida estructura científica y tecnológica en nuestro país, prestando apoyo a los jóvenes. La fundación cede a los autores los derechos de propiedad intelectual o industrial que puedan derivarse de la ejecución de cada proyecto. En los seleccionados en esta ocasión trabajarán 21 científicos gallegos durante los próximos tres años, y serán dirigidos por el catedrático de la USC Ángel Carracedo Álvarez, director de la Fundación Pública Galega de Medicina Xenómica; Miguel Ángel Fidalgo Pérez, del Centro de Investigación en Medicina Molecular (USC); Jorge Pérez Juste de la Facultad de Química (UVigo), y por Carlos Vázquez Vázquez de la Facultad de Química (USC). Next Wednesday, December 14th, will take place in Barcelona the mini-symposium “Private health data in the cloud”. This event, organized by the PanCanRisk consortium (pancanrisk.eu) is aimed mainly at research groups and organizations, Students, Project Managers Patients and Legal Advisers interested in the protection of health data, especially genetic data. The objective is to analyze the novelties of the new European Law of data protection and to comment with experts in the matter ethical and legal issues and the need to conciliate data security with the anonymity that is needed to preserve the identity of subjects that are tested at the clinical trials and research projects. While data is being produced, analyzed and reanalysed at a very high speed, we lack a common ethical and legal framework to facilitate genomic and clinical data, global science collaboration, and responsible research conduct. An international code of conduct should be designed to enable global genomic and clinical data sharing for biomedical research within a human rights framework has been proposed. In the following link you can find the program. Registration is free, but please confirm your assistance by mail (info@pancanrisk.eu) in order to access to the PRBB building. © Copyrights 2015 by PanCanRisk. All rights reserved.